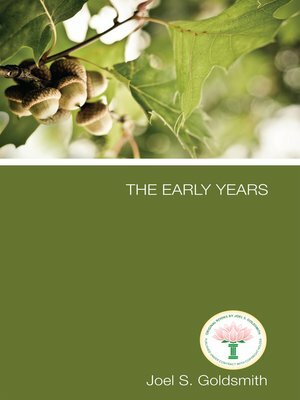 The Early Years is a book of letters written by Joel Goldsmith, one of the twentieth century's greatest mystics, teachers, and spiritual healers. "This book," Goldsmith wrote, "reveals the foundation for the great unfoldment which later came to me in my work, and which is now unfolded in my deeper writings." These letters were written to Goldsmith's students and patients from 1932 to 1946 while he was a Christian Science Practitioner with a worldwide healing practice. As more and more individuals corresponded with him and shared these letters with others, they came to be known as the "Dear Friend" letters. "These Letters do not constitute an attempt to teach Christian Science;" Goldsmith says. "The reason for publishing these Letters is that this volume may serve to help students who have not yet found a foundation upon which to build the greater awareness of God. It presents the foundational stones upon which the superstructure of truth and love may be built in consciousness." Each letter illuminates the relationship of love, truth, wisdom and candor Joel Goldsmith shared with his many "friends" while teaching essential spiritual principles and explaining how to embody these principles as their own.